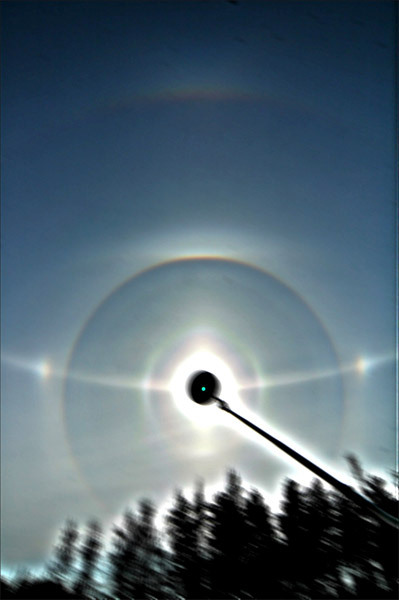 A long-lasting halo display was seen in Southern Finland on 25th April. The gems of the display were odd radius column arcs, of which 9, 20 and 24 degree arcs were seen. Additionally, 9 and 24 degree lower plate arcs as well as an 18 degree halo and possibly a 23 degree upper plate arc were visible for a short period of time during the day. The duration of the display was spectacular; for instance the Wegener anthelic arcs and 120° parhelia were continuously on the sky for almost three to four hours. At the latter stages of the display a beautiful 46° supralateral arc and magnificent circumzenith arc appeared. The display was photographed by many people - Marko Riikonen in Helsinki, Jari Luomanen in Tampere, Lauri Kangas in Espoo, Marja Wallin in Lahti, Timo Viinanen in Hameenlinna and Jukka Ruoskanen in Hyvinkaa. Wow ... I'm speechless! Congratulation!!! I hope you welcome us in july with similarly halo display??? WOW!! I feel the same way myself!! Theres not even a cloud in the sky. Tell those fine crystal cirrus to stop by in Ohio USA for 4 hours. Photos are stacked, that's why it looks like no cloud in the sky (filenames of my photos give the time span of stacked photos). Both Peter-Paul and I think, it's not accidentally, so many enthousiastic sky watchers are active in Finland. The Finnish climate and hence the atmospheric circumstances are outright favourable for rare halo forms and superb displays, so, halo forms such as ellipitic and odd radius displays are considerably less rare in Finland, in comparison with Ohio and western and central Europe. The latter areas are much more affected by the jet stream, and that implicates commonly an unsettled and turbulent atmosphere. developed and well-coloured upper tangent arc, together with a clearly visible parhelion and likewise part of the parhelic circle, in a limited area of a remarkably rapid moving cirrus field, at the rear of a cold front. At the moment of the observation, the axis of the jet stream was positioned exactly over The Hague. I'm almost sure that, if the atmosphere was much more quiet at that very moment, I would have witnessed a great display. It's not by accident, most great displays appear nearby high pressure areas; so was the case with the April 25th southern Finland display. We've been generally thinking the opposite here. If we were to take into consideration country area and number of halo observers Ohio and Netherlands probably scores better in high cloud halos. And to my view, that we have so many active obsevers is more due to well done groundwork than halos themself. Marko, no doubt: the Finnish 'groundwork' might be well-done indeed, but without the fine high-cloud displays, like the lunar display of April 12th/13th and the solar display of April 25th last, and all those brilliant diamand dust displays of last winter, the number of active observers in Finland would be remarkably lower. Here in Holland we experience, in periods with many fine displays, the number of observers increases; in poor halo periods the number decreases. Perhaps, in quantity, Ohio and western and central Europe score more halos, but considering the quality, Finland has still a more favourable climate, in my opinion.